Design Therapy: Go With The Flo. Monday was the first official day of summer and you know what that means...busy, busy, busy! Whether traveling or trying to wrap up projects, this season always proves to be a bit hectic and there never seems to be quite enough time. With that in mind, we've asked some of our closest friends to help us out over the next few weeks and guest blog here on DesignTherapy.com. 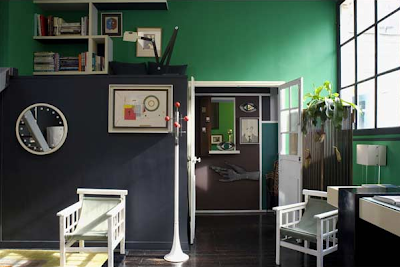 First up is talented, fellow interior designer Jayne Michaels from the firm 2Michaels Design. Jayne...take it away! Hi there-I'm Jayne Michaels and like the folks here at Design Therapy I'm passionate about design. 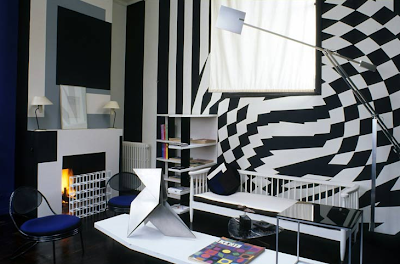 I am always on the look out for inspiration whether it be art, music, fashion, architecture and of course interior design. A few years ago I came across Florence Lopez, a Parisan antique dealer and interior designer. 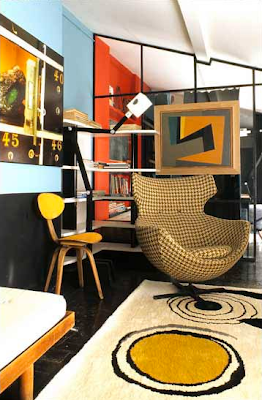 Her gallery of important 20th Century furniture has been featured in "German AD", "Spanish AD" "The World Of Interiors", etc. 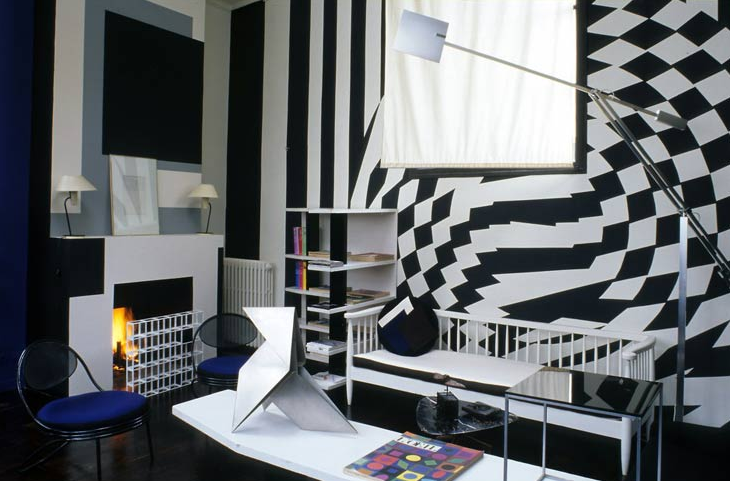 The Florence Lopez gallery located in an 18th Century building in the Sixth Arrondissement, also serves as her apartment, which she totally transforms once or twice a year. Like an artist, Florence Lopez uses her gallery as a canvas, a bold composition of color, texture and stark, graphic elements. 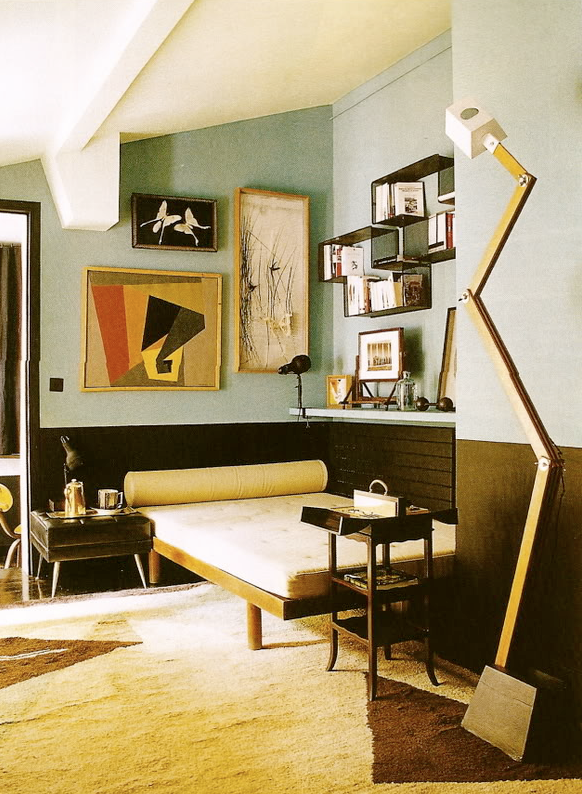 The Bauhaus, Robert Mallet-Stevens, Gio Ponti, Ico Parisi and Le Corbusier all hold court and are honored. Florence Lopez started her career working for the fabric house Etamine in Paris. From there she met and then worked for Jacques Garcia before opening her antique gallery in 1992. Above are a few examples of her work. I hope you find them as inspiring as I have. My Best, Jayne. Wonderful first choice guest blogger. Jayne has an amazing aesthetics radar, as demonstrated with the profile of Florence Lopez. Looking forward to all the DT summer guests. 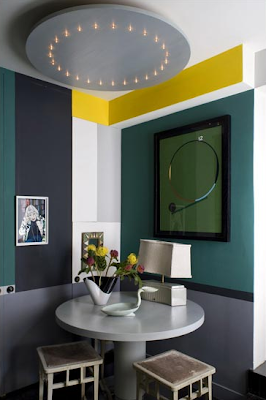 In my next apt: grey & acid green are most definitely getting the spotlight. Go Flo. Can't wait to see your stuff, Jayne! I love the second image with the repetition of circle shapes and the bold blocks of color in such a small corner...great effect! I love all the fresh bold colors. 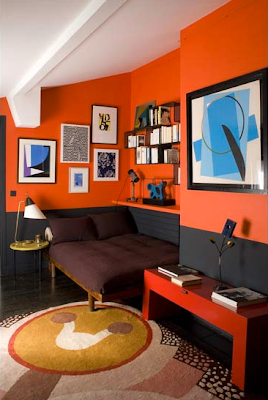 I personally live with warm gray walls, bright red-orange & touches of yellow-green & aqua. All of these are right up my alley. Also really like the lamps & light fixtures. Great choice of designer & rooms to share. This is usually much too colorful, avant-garde, and angular for my tastes, but... gasp! I love all of it! With winter approaching, the city's key looking Parajumpers Jackets malls in the discount year, some malls can be discounted 50% off Moose Knuckles Canada beforehand minimized to three.8 fold even inside range of Nobis Jackets Canada shopping malls are struggling to "shopping" price reduction elevated Canada Goose Jackets Canada many worries within the similar time, permits the general public a touch frustrated, "the variety of Goyard Tote Outlet searching malls price reduction offer will not Mont Blanc Pens Sale UK seem to be to think that so ah." with winter approaching, the city's principal looking malls in to the price cut Goyard Tote Outlet Canada year, some malls will probably be discounted 50% off previously decreased to three.8 fold even in amount of browsing malls are having difficulties to "shopping" reduction raised lots of worries Michael Kors Outlet Canada for the comparable time, enables the general public a tad frustrated, "the variety of shopping malls Karen Millen Sale discount offer does not appear to feel so ah." reporters interviewed identified Karen Millen Outlet that the discounted year does exist some "name Nike Shox Norge does not match reality "discount, the general public wishes to Amoy less costly exploring and Nike Free run Sverige glad considering the products, or to expend some effort to Nike Free Run Sverige Billiga measure up. That's so cool! The wall in orange is so beautiful. 0806jejeMême si les air jordan basketbol ayakkab? chaussures n'ont eu aucun problème à se vendre, le fait qu'elles possèdent des air jordan pas cher femme semelles en caoutchouc ne contenant aucune couleur ajoute à asics chaussures running gel zaraca femme leur allure. Les joueurs qui attaquent fort à la asics gel lyte 3 homme blanche jante et peuvent pénétrer avec une vitesse comme Rajon air jordan femme en solde Rondo et Russell Westbrook. Les chaussures réelles sont incroyablement attrayantes! Le asics gel lyte v rose gold pas cher revêtement de couleur jaune réel créé associé à des tiges basket nike air max thea femme pas cher en nylon pourrait vous faire inhaler très facilement ainsi que basquette nike presto facilement.